Arrival in Santiago de Chile. Get a first glance of the city during a tour to visit the main sights. Day at leisure for own activities, for example to do a full day excursion to the picturesque Viña del Mar and the beautiful Valparaiso. Full day transfer in public bus from Santiago crossing the Andes to Mendoza in Argentina. In the morning visit to a winery inclusive wine tasting. Optional: half day city tour in the afternoon. 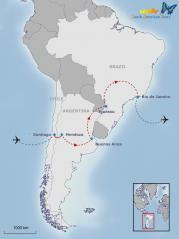 Flight to Buenos Aires. City tour through the vibrant and elegant city to visit the colourful La Boca district, the famous May Square, modern Puerto Madero and beautiful Recoleta district. Day at leisure. Optional full day visit of an Estancia with gaucho & folklore show including typical Barbecue lunch or visit of the famous San Telmo flea market (every Sunday). Half day excursion to the Tigre Delta (seat-in), a leisure area outside the city. Optional visit of a Tango Show inclusive dinner at Viejo Almacen Tango Show House. Flight to Iguassú. Visit the Argentinean Side of the Iguassú National Park, including the Devil’s Throat with the highest continuous fall. Visit to the Brazilian side of the falls with views of the full scale of the cascades. Flight to Rio de Janeiro. Rio is without a doubt one of the world’s most spectacular metropolises, stretched between forested mountains and the sparkling Atlantic. Full day city tour including visit of the Sugar Loaf and the Corcovado. Optional visit of a typical Samba Show. End of the roundtrip and departure flight or post-tour.